A Sound Of Thunder, whose most recent release bears the same name. Fears of rainfall were soon vanished thanks to the mystifying powers of Dirty Deal, sunshine quickly parted the clouds for the rest of the day. 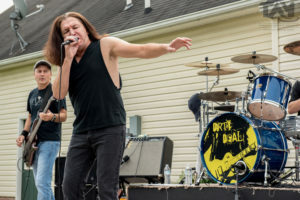 The lineup from start to finish completely rocked the place with the following bands in order of appearance: Dirty Deal, South Of Sobriety, Meridian, Caressing Steel, Shokker, Bleeding Black, The Bridge and A Sound Of Thunder. Everyone had a fantastic time and we cannot thank Tim Sirbaugh and his family enough for everything!